Vintage shows its trump card in 2014. California, France and Italy play major roles as in years past, but with an atypical mix of grape varieties and regions. The biggest story is Portugal and its best-in-a-generation 2011 harvest. Argentina: A free chart offers an alphabetical list of all Argentine wines reviewed for the tasting report in this issue. WineSpectator.com: BONUS VIDEOS Why We Chose the Top 10 Wines: Join Wine Spectator's senior editors as they describe the Top 10 wines of 2014—and the factors that earned them a coveted spot in our annual list. WineSpectator.com: FREE: Champagne Alphabetical Listing - More than 800 wines were reviewed for this report. A free alphabetical list is available. WineSpectator.com members can access complete reviews for all the wines tasted using the online Wine Ratings Search. WineSpectator.com: BONUS VIDEO Cristal Shines: Louis Roederer's Frédéric Rouzaud joined senior editor Alison Napjus to compare vintages of Cristal back to 1990. Learn about these superlative wines and how they evolve over time. 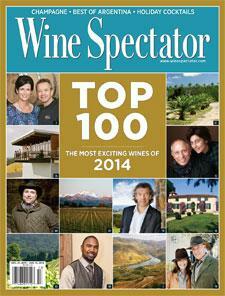 WineSpectator.com: FREE: Argentina Alphabetical Listing - More than 390 wines were reviewed for this report. A free alphabetical list is available. WineSpectator.com members can access complete reviews for all the wines tasted using the online Wine Ratings Search. WineSpectator.com: BONUS VIDEO Tasting the Top from Argentina: In 2012, Wine Spectator's Top 10 Wines of the Year included a South American beauty. Join Santiago Achával as he describes his dark, layered Achával-Ferrer Malbec Mendoza Finca Bella Vista 2010. WineSpectator.com: Check out even more coverage of all our 2014 New York Wine Experience events, including our Grand Tasting, seminar and Grand Award Banquet photo galleries. WineSpectator.com: Members can reference our full archives of columns and other articles on cheese. WineSpectator.com: Members can reference our full archives of columns and other articles on chocolate. WineSpectator.com: Members can reference our full archives of Jack Bettridge's columns and other articles on spirits. Third-Quarter Analysis - Domestic sales outshine Hong Kong; plus, the most expensive rosé ever sold? WineSpectator.com: Want to build up your cellar? Sign up for our free Collecting & Auctions email: Get a new collectible wine pick in each edition, plus expert tips on collecting, news and analysis. TOP 100 WINES OF 2014 What makes a wine a member of this exclusive club? Find out as our editors discuss this year's Top 10 in a video series and explain how we select them. Plus, view our full archives of all the Top 100 lists back to 1988. WIN GREAT PRIZES! Enter Wine Spectator's free Top 100 sweepstakes through Dec. 15 for a chance to win a two-night hotel stay; Napa Valley winery tour and lunch; tickets to our 2015 Grand Tour; or a high-end espresso machine. HOLIDAY HELP We've got you covered from Thanksgiving through New Year's Eve! Wine Spectator editors recommend great new recipes for entertaining, gifts for wine lovers, and well-rated, wallet-friendly red, white and sparkling wines. Chapoutier, Master of Hermitage: Michel Chapoutier shares his views on great wine, the winemaker's role, single vineyards and the balance of wine and food. Exploring 2001 Châteauneuf-du-Pape with Beaucastel: Marc Perrin joins James Molesworth to discuss a vintage that represents the start of a new era in the Southern Rhône. INTRODUCING ... RATINGS FLASH This new e-mail alert will let you know when we've added wine ratings to our searchable Wine Ratings database from your favorite wine regions. Just enter your email address and your preferred regions—we'll do the rest! Wine Ratings: Search more than 300,000 wine reviews. Education: Take Wine Spectator School's online courses, from the ABCs of Tasting to seminars on Food Pairing and more. Cellar Management Tool: Create shopping lists, track purchases and check collectible wines' value with the Personal Wine List. Our Advance, Insider and Tasting Highlights Reports: Get early notice on our editors' latest exciting wine finds.